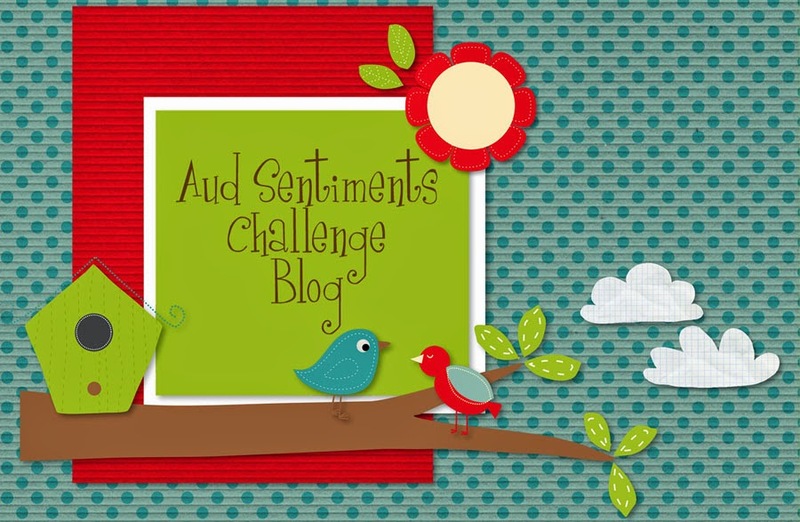 Well we are back from our little break and ready to start the new year with a new challenge..
Aud Sentiments #122 Use NEW in the sentiment or something NEW you got from Christmas / Holidays and state what that new item was..
Our sponsor for this challenge is Imagine That.. I chose to use their image Bloom where you are planted. This is the card I made using their image. I loved coloring this image and I added little white dots to the red boots to give a little more interest. Also added the butterflies for a little movement. I love the flowers in the boots. I have some old men's shoes on the front porch and have hen/chicken plants in them. Love the idea of the boots but our fence wouldn't work... The sentiment is from PTI and SS. Thought both worked well together and a nice way to start the new year. Hope you play along and remember to use a digi and the sentiment needs to be on the front of your card. recipe: image by imagine that, kraft base, wrmk winter frost dp, pti sentiment, ss sentiment, twine, jelli bean wood button, su butterflies, white gel pen, ranger ink and my cloud template. Welcome to the last day of the year and last challenge for the year .. But 2015 we will have more fun sponsors and awesome cards by the design team for inspiration. 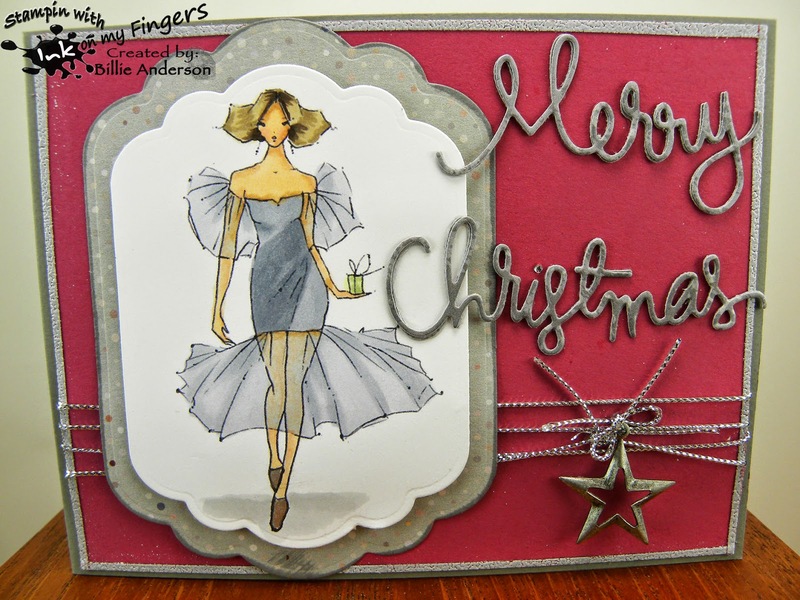 This is my card using Digital Delights image Sleigh ride Marcie.. I thought with Christmas being over that this would fit for a New Year's card. So I stayed away from the Christmas traditional colors and went for a more winter color theme. I hope you find time to relax in the new year and find time to play along at Inspiration Destination and enter your ATG cards every Wednesday. Have fun and Happy New Year!! I hope everyone had a Very Merry Christmas - Happy Holiday.. Ours was. I did a border of washi tape and stamped the snowflakes and little burst on the inside and colored her some fun bright colors and it's done. I like the simplicity of this card. I joined another fun filled challenge design team. Inspiration Destination where every Wednesday is a new challenge and it's ALWAYS ANYTHING GOES.. I love that idea. 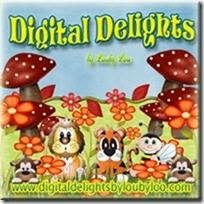 I hope you play along and join the fun at Inspiration Destination. 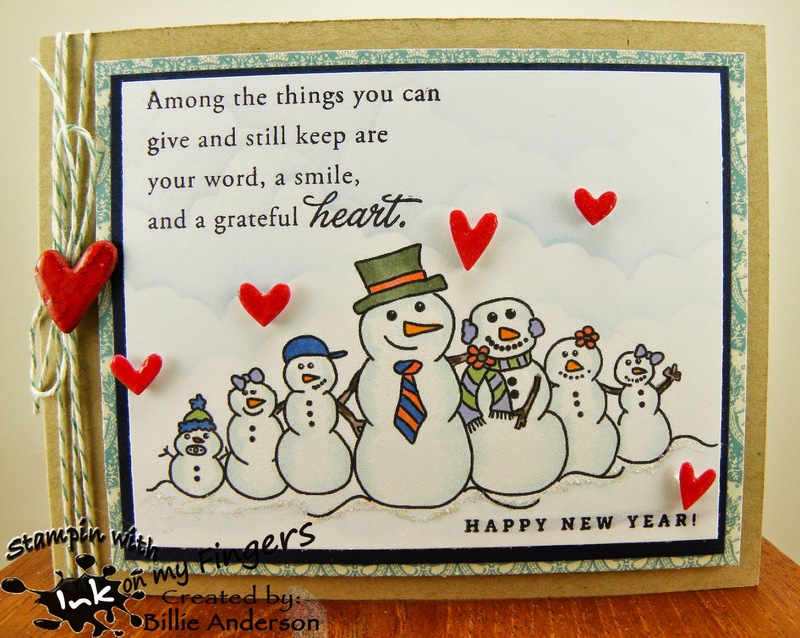 I chose the image snowman family.. With Christmas tomorrow I thought why not a New Years card. 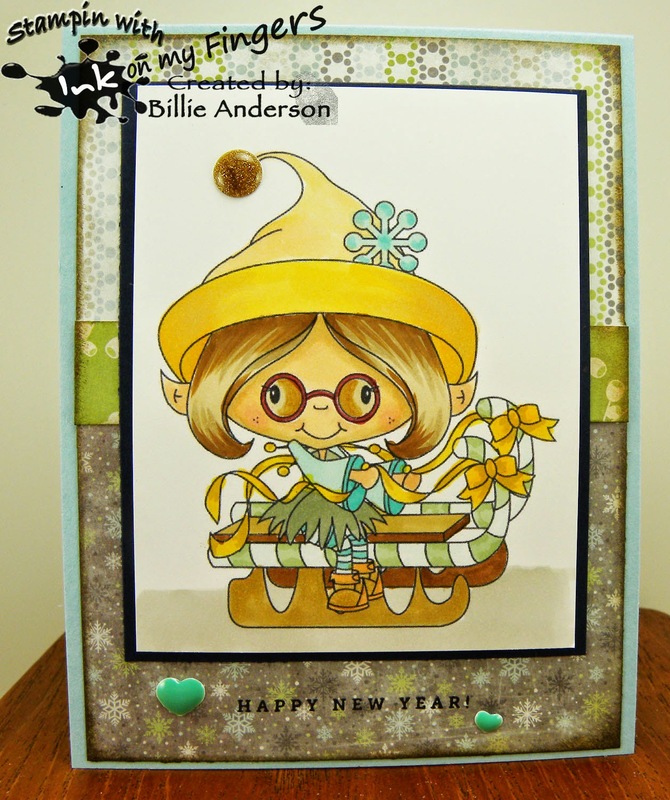 So I found a great sentiment from Paper Trey Ink and the new year stamp from Simon Says and went that route. I added the hearts and twine and called it good. 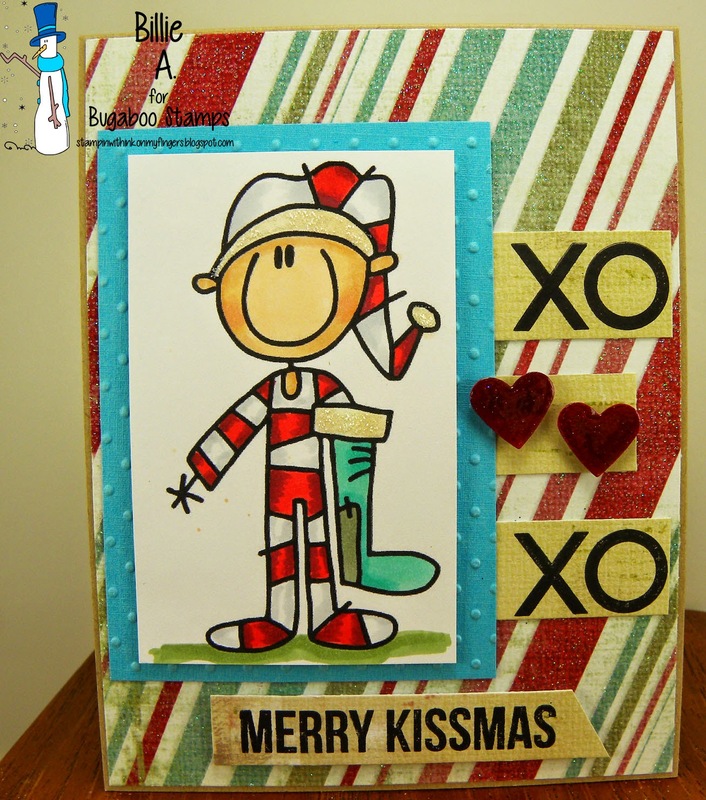 I hope you enjoy it and head over to Inspiration Destination and enter your ATG's card. recipe: sweet 7/snowman family, kraft, scraps, ss heart die, ss new year sentiment, pti heart sentiment, copics, twine, wink of stella, gloss accents, stickles, my cloud temp. ranger ink. 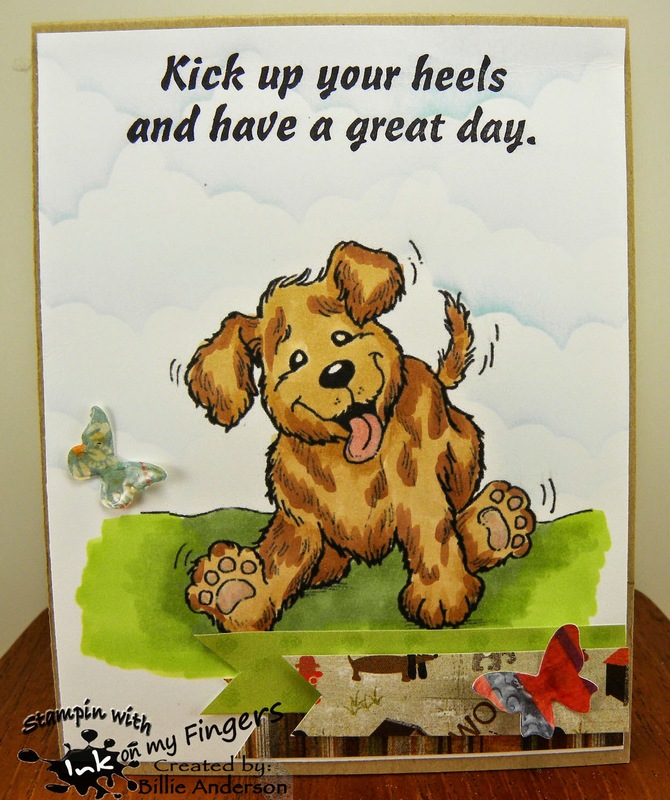 This is my darling card using the image puppy paws by Robyn's Fetish.. I thought he looked like he's chasing butterflies and the sentiment went well with the image. Sentiment is from Make an impression. I used some papers from Basic Grey and card base is Kraft. Pretty much clean and simple. Remember Inspiration Destination is always ATG.. Play along. I know you all are getting ready for Christmas / your holiday.. I hope you get a chance to look over at the Bugaboo store and pick up some awesome images for yourself or a fellow crafter for the holiday. This is the card I made using the new image. I love my coffee and this time of the year it's eggnog coffee blended latte but my go to the rest of the year is blended mocha latte. I love my chocolate mocha and molasses in my latte and I make it at home using some strong coffee ice cubes, then few more water ice cubes, 2% milk, scoop mocha powder and about tablespoon molasses. Blend it up and then I pour into my thermo mug to keep it icy cold. I take it to work and it last me at least 4 hours.. That is my one and only coffee drink a day but remember I said strong coffee cubes.. it's probably equivalent to 4 cups coffee. I like the blood shot eyes. 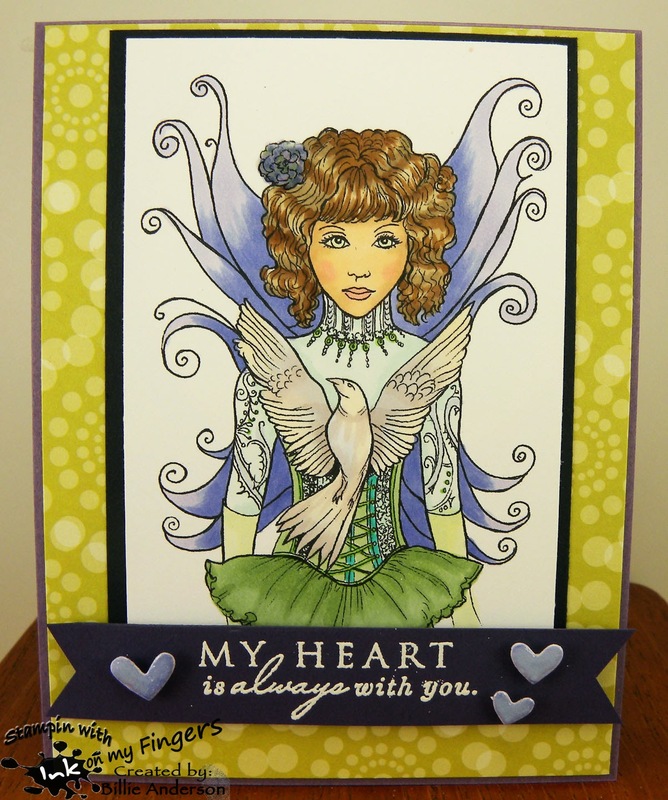 He was fun to color and I used some die cut feathers tied with twine and stuck the button heart through the feather ends. I added white gel pen to the cut just to add to the look. Given enough coffee sometimes I feel the same way. How cute is this little free guy, I just want to hug and kiss this darling. So excited for Christmas and ready with the stocking to be filled fun little pj's and happy face. Oh to see Christmas through the eyes of a child. I used a sentiment from Simon says and thought the little hearts from SU would kind a complete the look of the XO's. I like the sentiment. Welcome to Catch the bug and beings it's Thursday that means it's Oldie But Goodie day.. I chose to use Crow trio I did not color them as crows but hay they are my birds on my card so I can color them any color I wish.. .LOL. I think they are too cute no matter what kind of bird they are. I saw Kristen Werner do this side technique of the strips. I used a little thicker strips and they were all scraps so that made my pile even lower..got to love that. I just drew a line in about 1.25 inches from top to bottom from right side and then used my strips adhered them down and cut off the excess. I then added a brown thin slip over on the left side. I added the twine and used mounting tape to adhere to the card. I like the look. I took a mft hello die and clear embossed it about 3 times to give it some substance and adhered to the bottom of the card. Took some su punched flowers and added to the twine bow added viva pearl pen to the centers. I made this card kind of a filler for the slack of having cards this week. Only posting 6 this week..lol The image is from the Makeover digi company called fairy for kay leigh, I had it from when I was on their design team but they have closed down but images are still available. I thought using the work Love was a great word for a Christmas card. I thought her holding the baby looked like it would be Mary with Jesus. I really like the simple look of this card. I added glitter to her wings and colored her in copics. Cute little trio of penguins holding up their greetings. I used kraft as the base and a piece of scrap paper from Quick quotes and some scraps of red from club scrap, added a little bow to the top corner to go along with the pinkish sign of Love.. then the greeting in the bottom right, the sentiment is from PTI and thought it fit the image. Added some stickles and used my copics and glitter pen and corner chomper and it's done.. I am on a hit with getting Christmas cards done.. Hope you all are caught up and probably have most of them in the mail by now.. Welcome to Fitztown Challenge #66 WINTER Lets see your winter cards. I know it's Christmas / Holiday season so lets see those winter cards.. This is the fun card I made using Winter 10 image Click on the link and it takes you to the images. Choose craft and the image choice comes out and then just look through. There are so many awesome images I know you'll find some you like. I took a stencil I made and used some texture paste over it to give the snow look and before it dried I sprinkled glitter over it and put it aside, now I have awesome sparkly snowflakes. I then colored this darling image. She is so cute I love her. I added the ribbon which matched her coat fur really well and added the little brad and by then the paste was dry. I am loving this look. I embossed the greeting on the bottom. Sweet card and perfect for that granddaughter.. Yup. I think that is what I am going to do. 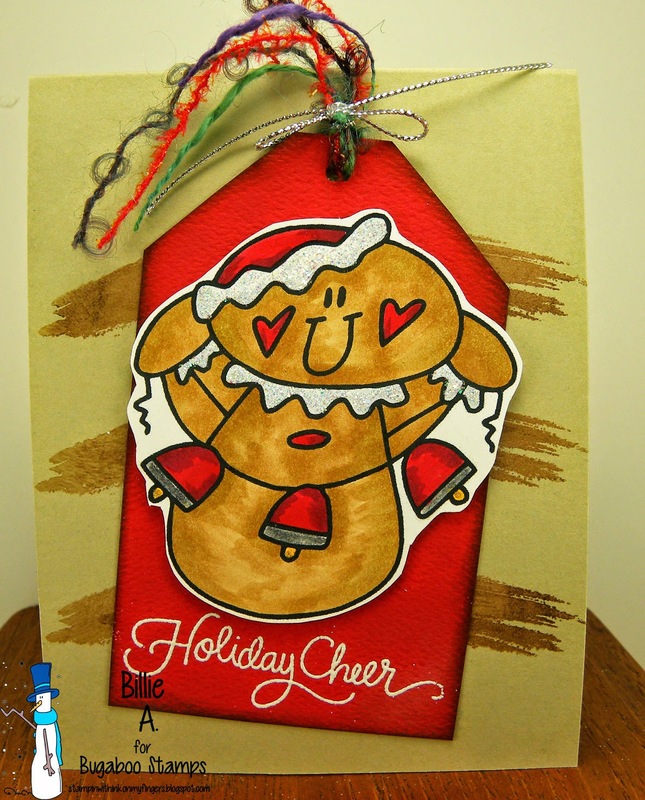 It's Free Friday - Ginger Bells so head over and get your free image. Well I hope you all have had a great week filled with Christmas Chaos and have at least 7 more cards made.. well today at least 6 cards made.. Todays challenge is Clean and Simple and I used the Free Friday image Ginger bells. 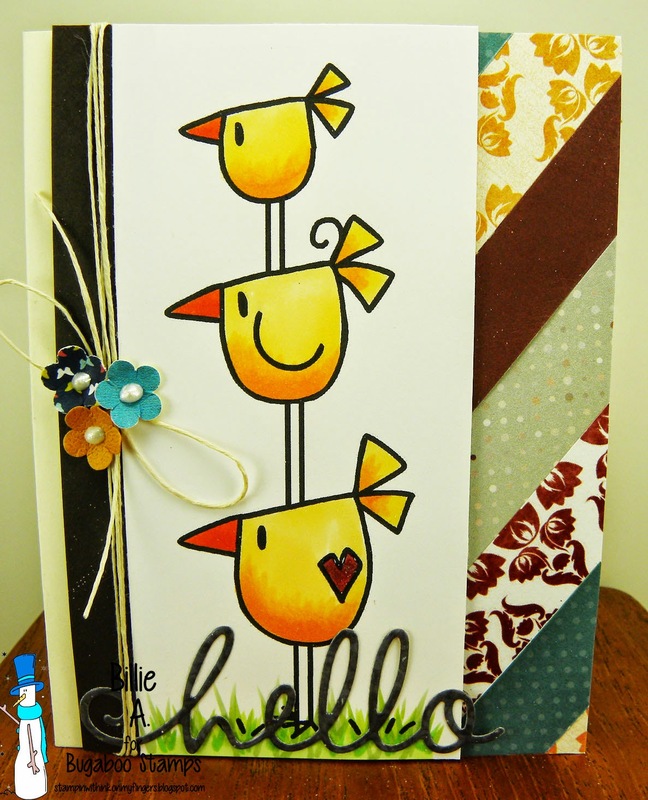 I used the abstract swish stamp from My favorite things and because it was not long enough and I knew the tag would hide the center I stamped one half closer to the right edge of the card and the other half of the image to the left side of the card.. The tag covers the non stamped area. 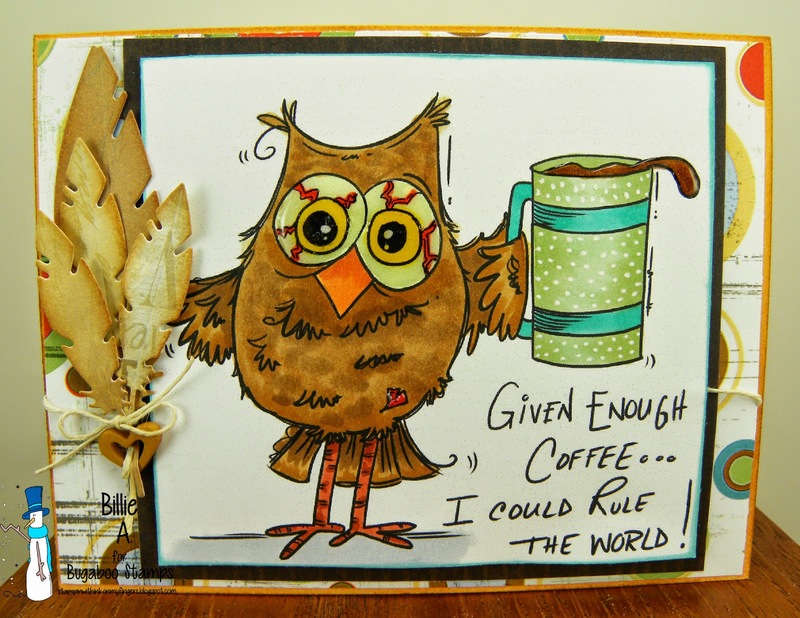 I have a friend in Germany who makes Tag cards and I love this idea and so thought of her when I made this card. How did I do Monika?? I even kinda angled it.. It's clean and simple that is for sure. Just make a card with critters in it.. 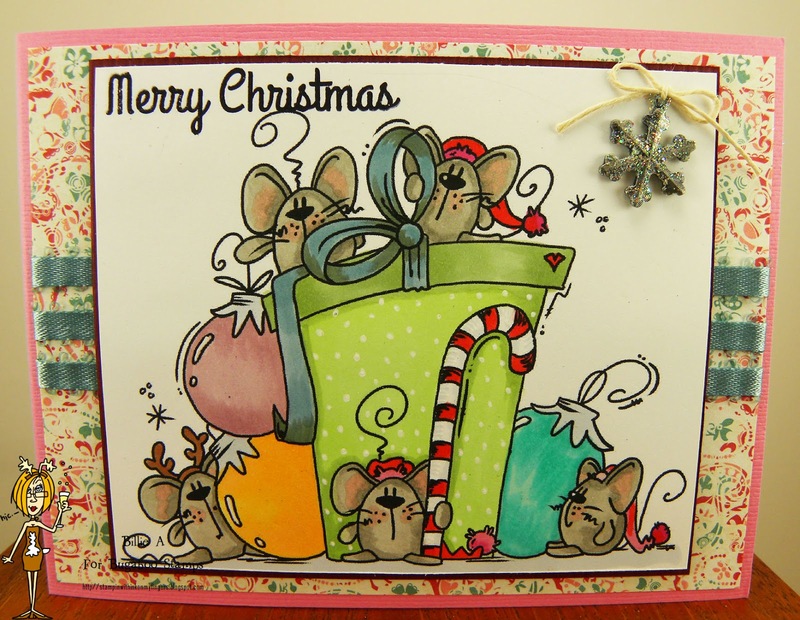 Hence the card below called slchristmasmice I know they are mice but they are cute and they are critters. I had a great time coloring this card. I added the metal charm to the corner and dusted it with some glitter and added some ribbon to bring out the gray/blue color in the paper. 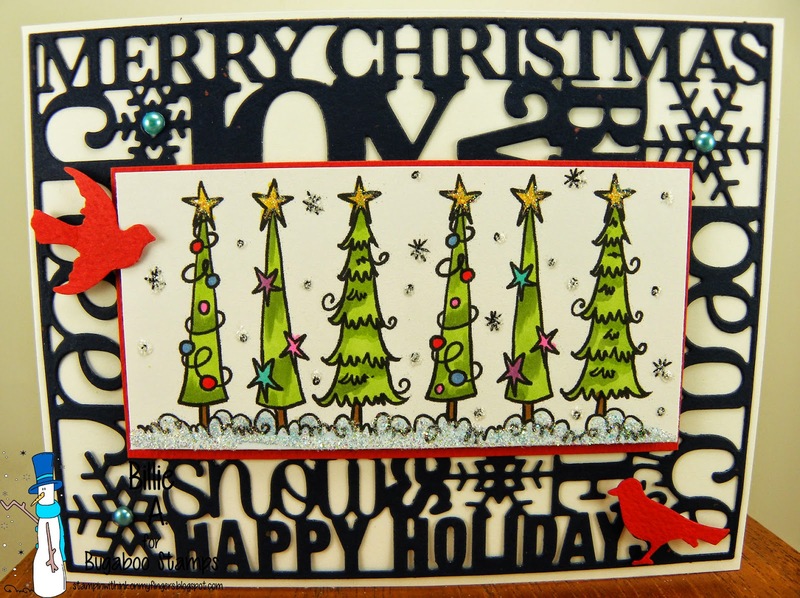 I am loving this card and that it's another Christmas card made for this years giving. Catch the bug day #5 - Humor me Wednesday / Which one stinky or sticky? I used the image called reindeerxmasgoodies he almost looks like he's had a little too much holiday cheer? or confused.. I asked hubby to help with the sentiment and so he chose the "which one stinky or sticky?" I added "hope your Christmas is sweet" so that is how the sentiment came to be. LOL. Todays challenge is RECIPE: 1. image,. 2. of something 3. of something else.. I hope you play along and link to the Catch the bug site. 2. birds 3. half pearls It's a pretty simple card but eye catching huh? I really love this background die from lil inkers. It's awesome cut out of the dark blue paper and layered onto the white. You have to use card stock for this die vs. a lighter dp it just doesn't hold up too good if you use lighter paper. 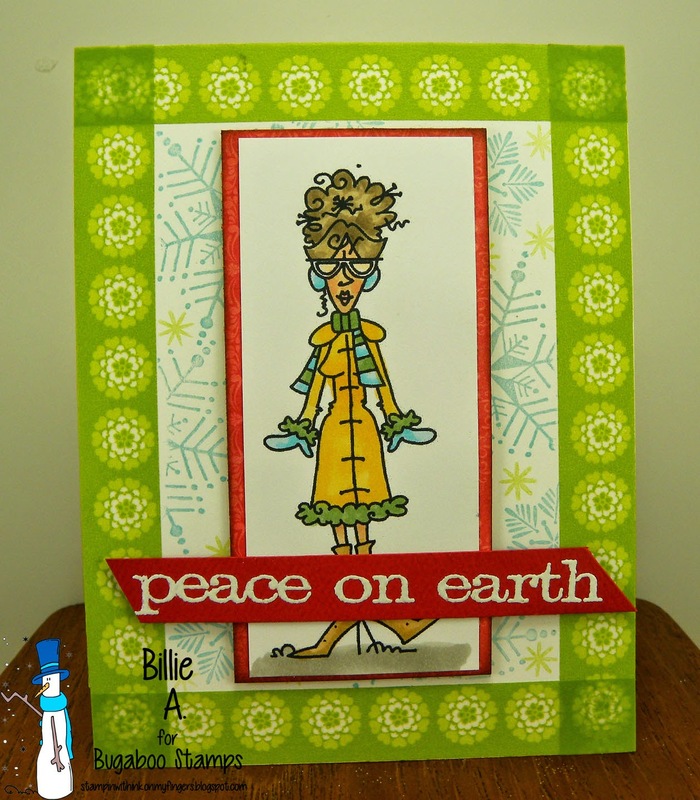 Today is day #3 of the Christmas Chaos at Catch the bug and today is color challenge. 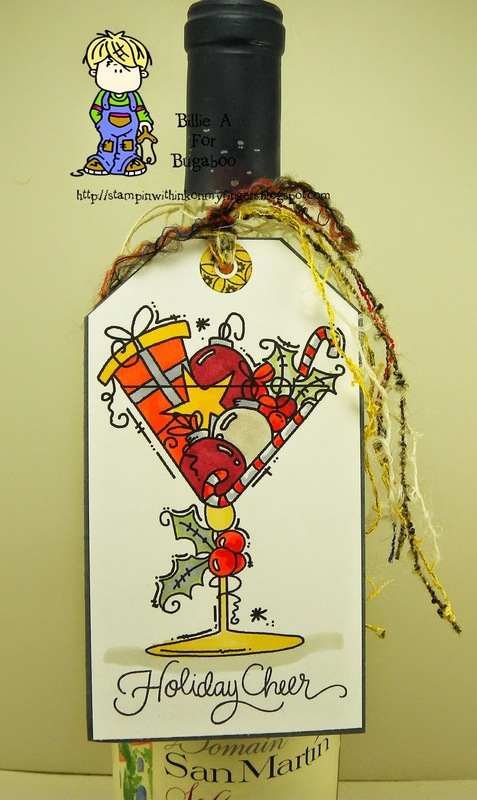 I decided to make a wine bottle tag and used the holiday cheer glass for my color challenge. I colored using copics and tried to match the colors as best as I could. 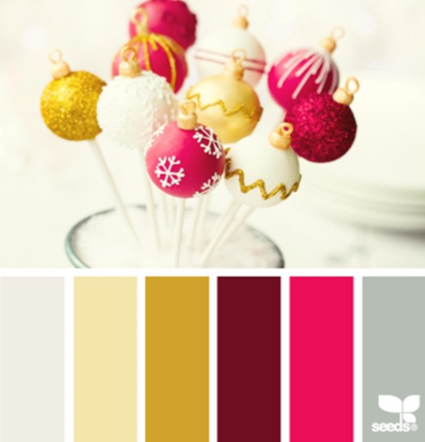 I love these colors for Christmas. I think this tag makes an awesome way to give a gift. Well today is day #2 of our Christmas chaos at Catch the bug and we have a Sketch for you today.. This is my card and I kinds of made the sketch.. 99% is right. I had this darling image of lady sitter present and I just had to use her and I had this chip board frame which I colored with an ink pad then added glue and sprinkled glitter all over it. I love the way this card came out. It in real life looks awesome. I used a white pen and gave her a frosted hair look. Liking the touch to her festive look. Fun card and challenge. I cut the image out using mft circle die and layered her on the ss circle ring die, I have the left over circles and a few other that I punched out and made a flower for the lower corner and added some cording behind it to give it some more texture. I colored her in copics. I love the blues and greens together. Make sure you check back tomorrow at the Catch the bug blog, as we are having our week long Christmas Chaos, and tomorrow Saturday we have the kick off of our Christmas chaos and the rest of the week is full of fun challenges, prizes and beautiful creations. I will be posting daily so hope you enjoy. You will be inspired by our design team so check the Catch the blog daily. recipe: jj ornament, su base, dcwv, circle punch for solid looking blue ones, copics, su cording, brad, mft die, corner chomper, wink of stella glitter pen on hat brin and ornament.. think it's getting dry (but I did add more water to brush, probably need to sake it better. Paper Pretties has kindly given us on the design team the month of December off to spend time with family and to relax and get ready for the holidays. That is so awesome. Thanks Heather. In the mean time, this is a great chance for you to stock up on Paper Pretties supplies, there is an HUGE sale going on for the whole month of December. That sale is 50% off your entire order and to get that 50% off you just need to choose the items you wish. At the check out in the promo code area you want to type in THANKYOU. And if that isn't enough remember that any order over $50 you get free shipping. So what will Santa bring you for Christmas / The Holidays??? here's the chance to fill your stocking. 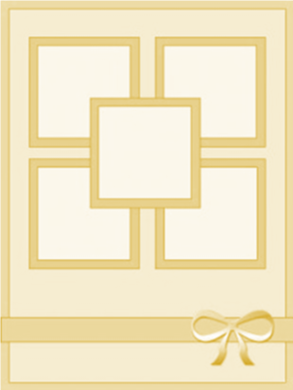 We will see you in January 2015 for a brand new month and year of challenges. 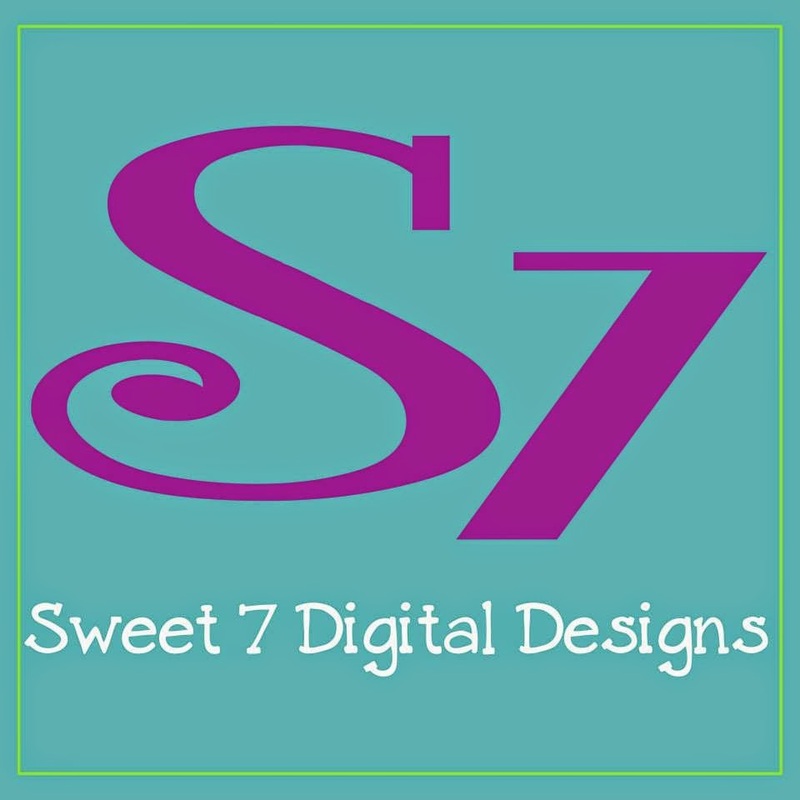 I will be posting on my blog pretty much most of December with the other design teams I am on. This is the bingo page. Choose three in a row.. you all know how to play. Just have fun and make sure your sentiment is on the front of your card. This is the card I made using the Tiny fashionable present image. 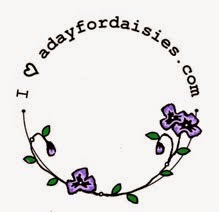 I am loving this image as I do all of the day for daisy images. So elegant and fun to color. I decided to go with the silver theme. I love the way this dress came out.. I put silver paint on the shoes and it looks better in person than in the photo. 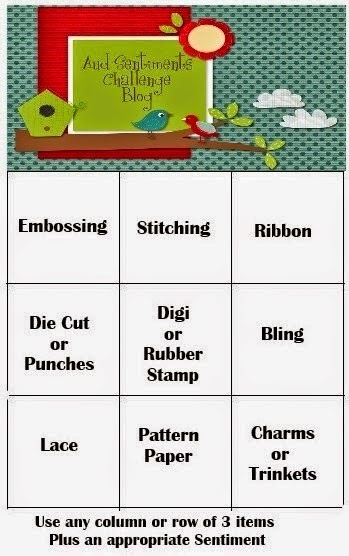 I chose to use the diagonal row.. Embossing / the thin red line tape with silver embossing powder, digi /tiny fashionable present, charm/star.. 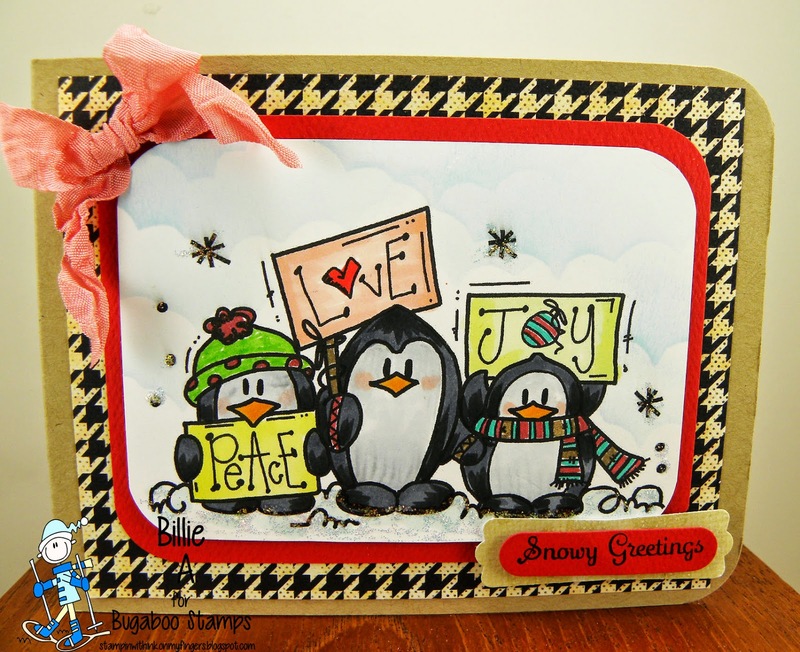 I used the Simon says Merry Christmas die and layered it a few times to give it more bulk. Added the silver cording. I went over the dress and the letters with wink of stella but its hard to see on this posting.. wish you could see how pretty this actually looks. Fitztown has released some new images. This is always a fun time when that happens. This is the image that I chose to use. Sorry I don't have the name for the image at this time. If I get it I will add it to the blog. Right now she is known at 0003... You can check out all of the images and soon the new ones here. They should be posted there if not now then soon. I wasn't sure how I wanted to color her so I started with the bird first because that was the most scary part.. I have to admit I think the bird came out pretty good. Then I chose the other colors from there so that the bird would stand out. I like this card. I used the sentiment from PTI and embossed it in white. I added some glossy accents to the hearts and the flower in her hair. Wink of stella glitter brush on her wings and the hearts. OH I love this image. Hope you check out the store and I am sure I will have more info before long to update this site.